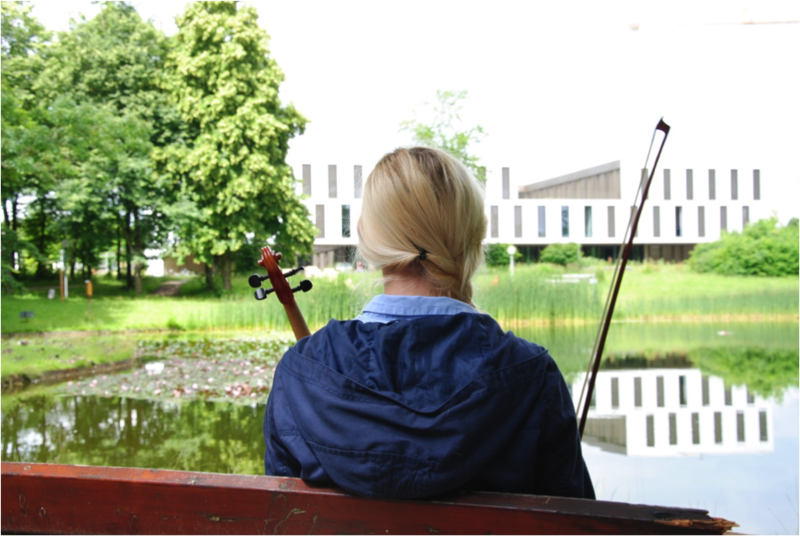 Once you enter the arts and music building of the University of Augsburg, soft music fills your ears. It may be someone singing, playing the violin, cello or the clarinet. Surrounded by beautiful artworks you can listen to students practicing compositions from Bach, Debussy or Beethoven, wander the futuristic hallways and just enjoy the mix of sounds coming from the rooms build deliberately for practicing. It’s the magic of music. It has the ability to transport you into another world, another galaxy, another dimension, where you can forget all your worries. Each semester you can experience this phenomenon a few times, when the Chair of the music faculty organizes a concert outside or inside the white building. Either it’s a huge event like the “Campus Se(e)renade” or the “Faschingskonzert”, or it’s the small get-together of the “Mittagsmusik” each Wednesday at 12 o’clock in one of the small room in the arts and music-building. 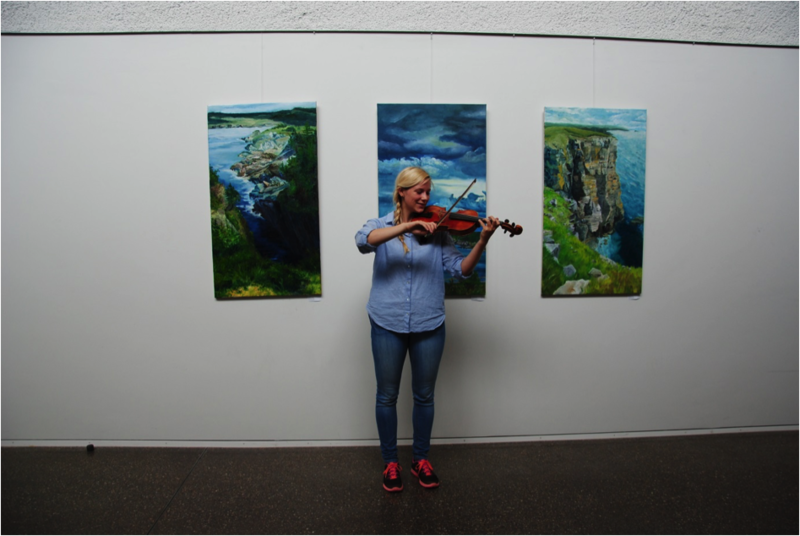 One of the participants of said “Mittagsmusik” is Lissi, a student of the University, who plays the violin. Me: How do you like the arts and music-building? Lissi: I think it’s beautiful! It´s full of light, pictures and sounds – actually it´s kind of like a little museum! Me: Do you listen to a lot of concerts on the campus? Lissi: Sadly, I’m not that often in Augsburg and the concerts are often during my exams! But when I’m around and when I have enough time, I love to go to the concerts. Me: So do you think the musical presence on the campus should be more significant? Lissi: Actually I think music is everywhere here on campus! There are so many concerts, a lot of them at the end of semester and also during the year! Also, have you seen all those people running around with their guitar-cases or other instruments? I love how here on the campus you immediately see that music is really significant just by observing the students. And not to say the least music combined with arts has its own building here! Not every University takes such an interest in this department! Me: You have a special bond with music, because you play the violin. How long have you been playing it? Lissi: Yes, music is very dear to me! 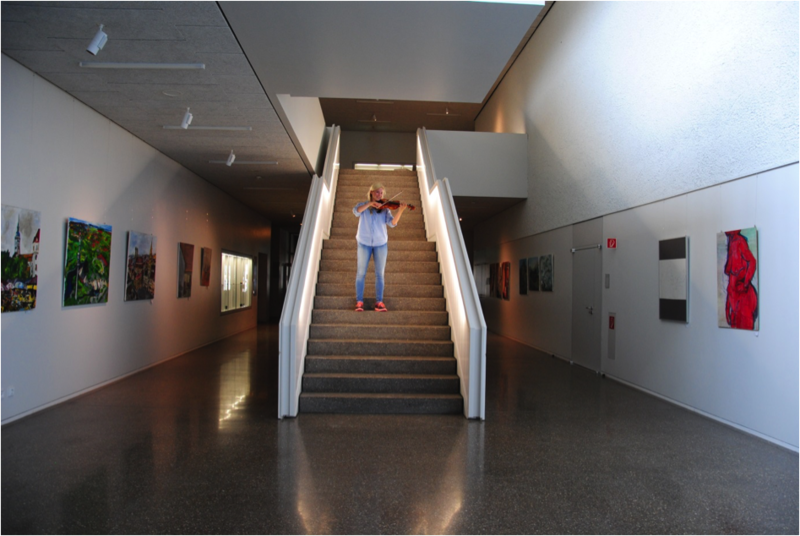 I’ve been playing the violin for sixteen years! Me: That’s awesome! Maybe it’s a difficult question but why do you love music? Lissi: I think music is the easiest way to transport different emotions! An easy example for that are all those people, who listen to sad songs, when they’ve been going through a bad breakup! Music touches me, it gives me goosebumps. In a way, music is the one language the whole world understands. That may sound cheesy, but it’s true! Me: Yes, that’s exactly what I was referring to when I was mentioning the “magic of music”! So Lissi, one last question: Which song will you be playing at the “Mittagsmusik”? Lissi: I don’t think anybody knows it. It’s the 3rd Part of the “Concertino Op. 24 for violin and piano” by Oskar Rieding.